ETS for Animals - Perelandra Ltd.
ETS for Animals is a solution just for animals that is perfect for any sudden or "unscheduled" situation that can be large or small, serious or passing. It's for all those events that can occur with our animals that we don't plan for, would have appreciated not happening and that cause confusion, pain, panic, irritation and fear. It can be used for any animal — furred, feathered and scaled — any time they get "rattled" and thrown off balance, including those thunderstorm freak-outs and other times your animal panics or experiences anxiety or fear. (Travel, sitters, vet visits, new animal or person in the home . . . ) Use the guidelines and examples for ETS for Humans (adults) for addressing your animal's needs. 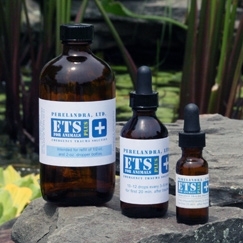 ETS for Animals should not be diluted. To avoid contamination, do not give your animal its dosage directly from the dropper. Instead give the solution to your animal by putting a dose (10 - 12 drops) in your hand, a spoon, a bowl or a clean plastic syringe. If your animal insists on being enticed, put the 10 to 12 drops of ETS for Animals on the tiniest amount of irresistible food as possible. I keep ETS for Animals available for any crisis in my animal life, but the most powerful use I've found for it is when an animal is in the process of dying, or has just died. Used as directed by Machaelle, this product brings about tangible ease in the animal as it releases its body. Sometimes an animal will have difficulty leaving its body due to the human's attachment, or a sudden death. In those cases, the ETS for Animals creates - or allows for - a smooth gentle release for the animal's life force. As a clairvoyant, it's easy for me to perceive the difference that ETS for Animals makes.